The average person (male or female) has 2.6 million sweat glands in his or her skin. They cover almost the entire body and weigh a combined weight of three ounces! There are two types of glands that produce sweat: eccrine glands and apocrine glands. Eccrine glands are those found on the arms, back, chest, palms, soles, and forehead. Apocrine glands are those in the armpits and groin areas which produce the thicker, yellow sweat that is known for causing stains on your clothing. Click Here for a Hyperhidrosis Solution! Hyperhidrosis is a disorder that causes overproduction of sweat through both eccrine and apocrine glands in the body. People sometimes have hyperhidrosis in only one area, and some have it in several. When it occurs in the hands, it is called palmar hyperhidrosis. When you experience excessive sweating in the feet, it is labeled as plantar hyperhidrosis, and sweating of the armpits is known as axillary hyperhidrosis. Kleinert’s has proven solutions for each condition. Affecting up to four percent of the population (twelve million in the U.S. alone), this disorder stems from the sympathetic nervous system. However, there is no known cause. It can be cured with surgical procedures and controlled with alternative medicines like herbs and acupuncture. There are, however, much simpler and more economical solutions as well. At Kleinert's, we offer many patented solutions to help those suffering with hyperhidrosis. 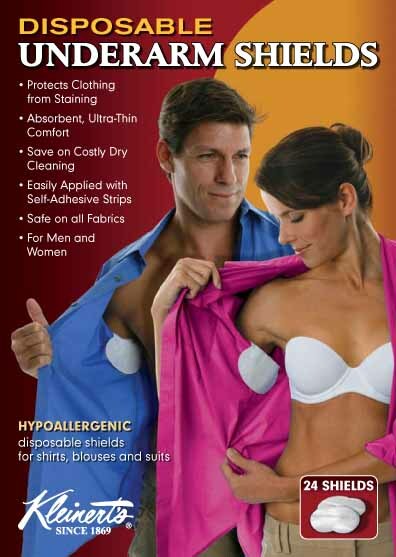 We carry dress shields, garment shields, bedding protectors, shoe sole inserts, sweatproof undershirts, clinical antiperspirants and more. All of our items are hand crafted and guaranteed to be effective, so you're sure to find a great product that will meet all your anti-sweating needs.